I'm still struggling to get down this rotation. Having only one instant with a 9 sec CD, and one possible talent instant with a 15 sec CD, there's not a lot of easy filler, which means you've really got to have your shots planned out ahead of time. However, with the extra focus from crits on Aimed Shots, you can't totally plan ahead your shots; so it's not uncommon to have 4 seconds left until Chim Shot is off CD, and not be sure if you'll have enough focus to cast two Aimed Shots, but if you cast a Focusing Shot, you'll have to just sit there for an entire second. I imagine I'll get the hang of it and stop having to think about it so much, but my parses thus far have been, well... clunky. Another interesting thing that happened was, though it's overall kind of boring to have to sit still and have long, slow casts, it does make Rapid Fire really exciting. I found myself getting excited every time my Rapid Fire countdown started to get close. Sure, it's all relative, but at least it's something. As for TotH, it's still coming out the strongest of it's tier, at least in ways I've found to play it. Though with the nerf, it's even more important that you wait for a fresh proc of TotH before casting Rapid Fire. Hey Marksmen. Heard a bunch of places that Chimaera wasn't worth using at current tuning, but can't find any evidence of that. Any info? These numbers are based on a 20 minute fight with a 20mil HP Killable training dummy. So while I would say that the numbers aren't realistic, their relative value should be fairly close. It seems pretty clear that Aimed Shot is not a more powerful shot than Chim Shot. There's really no question there. Perhaps what some people had been trying to say was during Rapid Fire, Aimed Shot is more powerful than Chim Shot. With the current formulas for Aimed Shot and Chim Shot, that's going to remain true until around 41% or greater crit. Even at that point, Chim Shot remains an instant cast, and Aimed Shot, of course, keeps its cast time. 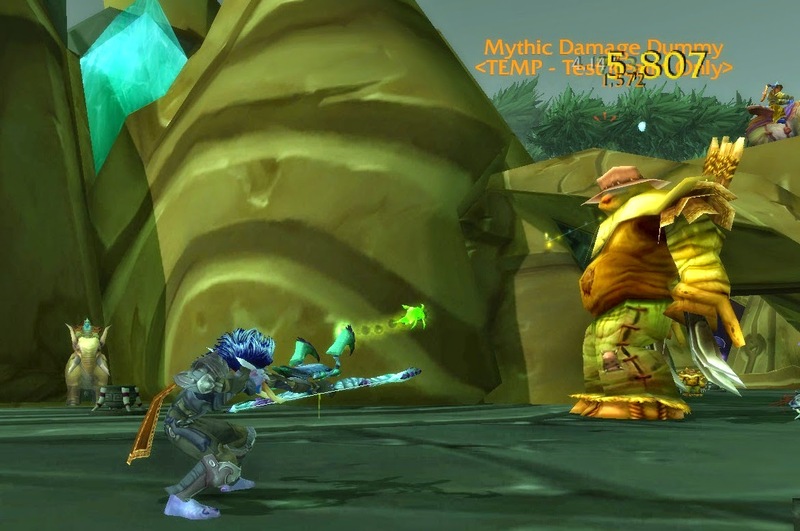 As the expansion goes on and our haste levels go up, we may see a situation where we'll want to completely just spam Aimed Shot during Rapid Fire, but at least for the first tier, that's not going to be an issue. Over-all, while I'm not super excited about how close in damage all three of these are, Chim Shot (other than when in Careful Aim), especially as an instant, is considerably more valuable than Aimed Shot, as it should be. And Kill Shot is right where it should be, well above Aimed Shot, but not quite competing with Chim Shot in damage. Speaking of Kill Shot, I did test it out while trying to practice Sniper Training, and the reset is definitely faster now. Only around max distance did it take longer for the shot to reset than a global CD, but even then it wasn't much longer. As long as you can stay within 30 yards, hitting double Kill Shots shouldn't be a problem. Overall, it doesn't seem like these were enough of buffs to make MM competitive with BM. It could be that I'm just not playing the rotation well (which is true) but, as I've stated before, I don't see anyway that someone plays MM unless with sniper training, it's considerably higher in damage dealing than SV or BM, which so far, is not the case. Of course, my playing at the Training Dummies isn't in the slightest bit conclusive, and I'm sure there are still many rounds of tuning to go before we start to get an impression of how the specs will stack up together. However, MM is so far looking pretty tough in PvE, and it's hard to imagine how it could work in PvP. I haven't given up hope, but I am having a bit of trouble being optimistic about MM in WoD. Hit the break for an addendum SolarFlair pointed out on twitter. There's a good conversation going on over in twitterland, so I wanted to add some of that here, for those who don't like searching through crazy long chains of tweets. @DeliriumHunts Try w/ haste values, believe 2 casts + global < hardcasts atm. With TotH ofc. Numbers pass fixable, but in a poor state. This is a good point from Solar, and was were a lot of the complaints that spurred Celestalon's original tweet up above. It is definitely true that 1 Chim Shot and 2 Steady Shots does considerably less damage than 2.258 Aimed Shots (which is how many Aimed Shots I can get off in the same amount of time). It could be that I'm not understanding the issue correctly, but to me, it seems like that would indicate a focus management issue, if you're having to cast Steady Shot or Focusing Shot during Rapid Fire. This is why I mentioned above that I want to wait until I get a fresh proc of Thrill of the Hunt before I cast Rapid Fire. At a 1.55 sec cast time in Rapid Fire (which is where I am right now), I have just barely enough time to cast 9 Aimed Shots and 1 Chimera Shot during Rapid Fire. Assuming I crit all of my Aimed Shots during Careful Aim (which isn't a huge presumption), if I get a bit of luck, all of my Aimed Shots will cost 10 focus each, which would make the total I need during Rapid Fire 125 (9*10+1*35), which is very easy to manage with no Steady Shots/Focusing Shot. The most unlucky I can be, is I only get the 3 TotH procs I have at the beginning, which bumps my total cost up to 245 (3*10+6*30+1*35). Unfortunately, the most focus we can have available during Rapid Fire is 206, 120f + 13.45sec * 6.4f/sec (13.45 sec because that's how much time would have passed when we began to cast our last Aimed Shot). So we'll come up about a chim shot's worth of focus short. In this case, we will be DPS ahead if we just keep spamming those Aimed Shots. So, as with many things, it's going to come down to RNG, and how lucky we get with TotH procs. This is one of the reasons the nerf to ToTH hurts as much as it does. To come up with a rule for how to react while playing, we can just look for a number minimum number of TotH procs we need to not need any Steady Shots. Sparing you the algebra, the magic number we're looking for is 6. That is to say, if you use your original 3, then get one more proc (giving you three more reduced cost Aimed Shots), you'll be able to spam Aimed Shots and a Chim Shot (assuming you start with >105 focus). I'll be interested to see if the TotH nerf remains, or if they perhaps decide to buff Chim Shot. Seeing how MM is still struggling for DPS with a lot of restrictions on movement, I can't imagine them making it through the tuning phase without getting some sort of buff to Chim Shot.